Same. Few left to build then I'm done. Great intro to the hobby though. Desk is coming together - paint shelf just needs to be built and then good to go. Got my photobooth corner of it sorted tonight, pretty happy with the results (kits previously linked here). itrdc5, Andy3008 and the_fuzz like this. Tamiya for spraying (super thin with retarder), Vallejo for brush painting. Adding MRP to that soon. AK/Vallejo Pigments, 502 oils for washes. Finally got around to finishing this kit - really not that happy with it, something I can't put my finger on. 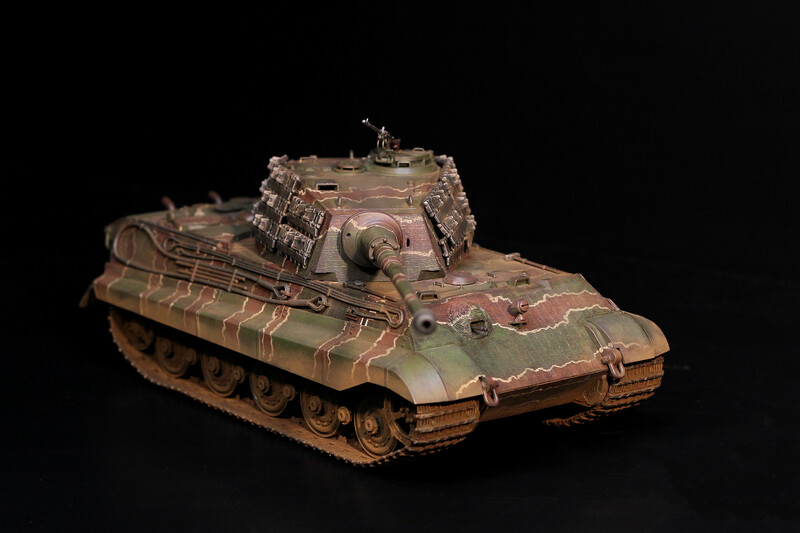 It's a Tamiya Tiger II H kit with some extras to model it after the Sla. 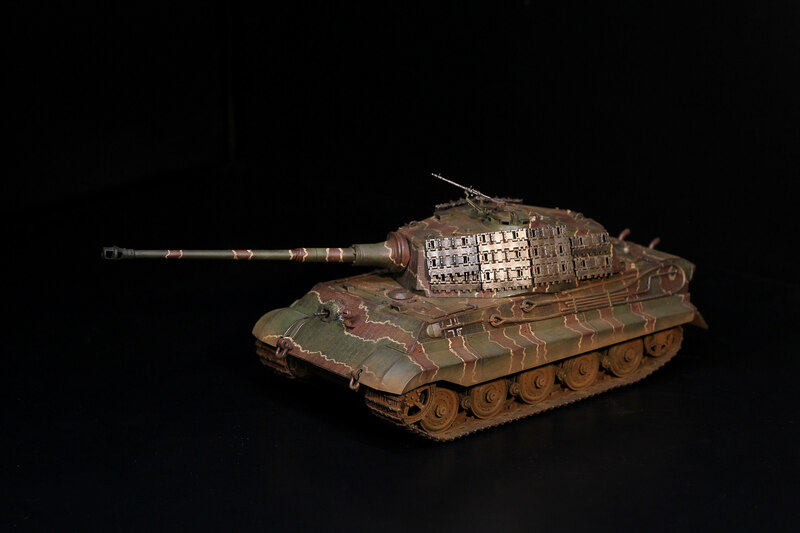 16 diesel version from War Thunder. Big thanks to Bern for the spare track links. Really need to diffuse my lighting. Looks pretty damn good to me. Interesting camo scheme. Question without notice, using Tamiya paints, do you mix to get German dark yellow ? Tamiya XF-60 doesn't cut it for me. Yeah absolutely, XF-60 alone has too much green in it for me, but I know some people do like it as the colour varied heavily towards the end of the war as it was thinned with whatever crews had on hand. For Dunkelgelb I use a 50/50 mix of XF-60 Dark Yellow and XF-55 Deck Tan. Some people also chuck some buff in there. Jagdpanther up a few posts has the 50/50 mix. Cheers for that, trying to find the right blend is very hit and miss for me at the moment . And as you said, the Dunkelgelb changed later in the war. I've googled the Tamiya Dunkelgelb mix and people use such a concoction and found a spreadsheet from some guy who has recorded all his ratios to get WW2 German colours, and his Dunkelgelb ratio is XF-60 with a little XF-2 , go figure . 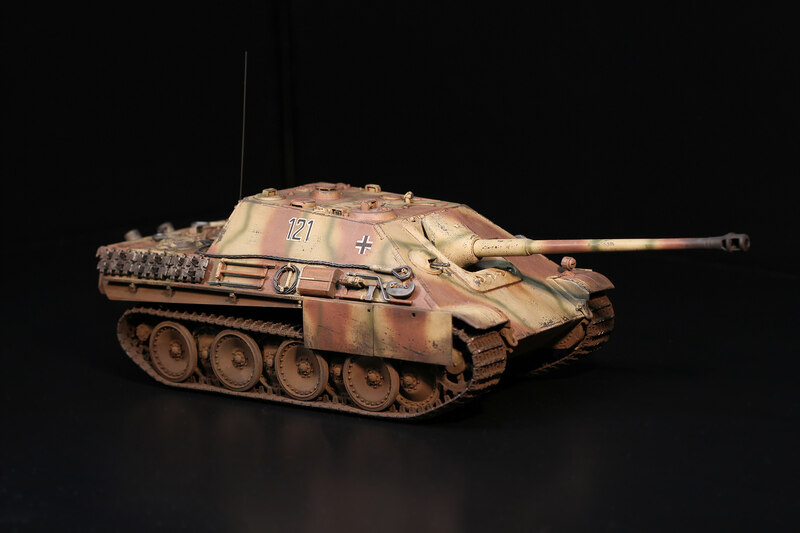 The Jagdpanther colour looks good, I was eyeing that off before. New setup is pretty much complete now. millen, /\pocalypse, Rainey and 1 other person like this. Looks nice and organized, good stuff. Need to work out a system for that right hand side but it's getting there. Need to whack in a laptop on an arm mount at some stage too but that won't be until Christmas or so (considering streaming builds). Forgive my ignorance... What's the pot thingy near your two air brushes? Cleaning pot, you spray the the thinners/paint post-clean into it. do you paint there? I assume a small spray booth sits on the desk? I've got a DIY extractor fan from my old setup that sits under the desk when not used while I decide how I'm going to properly set this one up. Now that I'm spraying acrylics with lacquer thinner it's definitely a necessity. The desk is really deep so the aim is to do something permanent on the right hand side (large window immediately behind the desk) for ease of exhaust routing and access but I'm all ears for how to set it up. Are you talking about the Tamiya paints ? I read a blog somewhere that said the lacquer thinner was better than the X-20A thinner when using an airbrush. BTW- What airbrushes have you got ? Yeah I spray Tamiya acrylics with lacquer thinner - Tamiya/ Mr Hobby. Better finish for sure. Iwata Eclipse and a new H&S Infinity that I haven't used yet. I have the Eclipse and mate only ever uses H&S so tempted to try one as well. 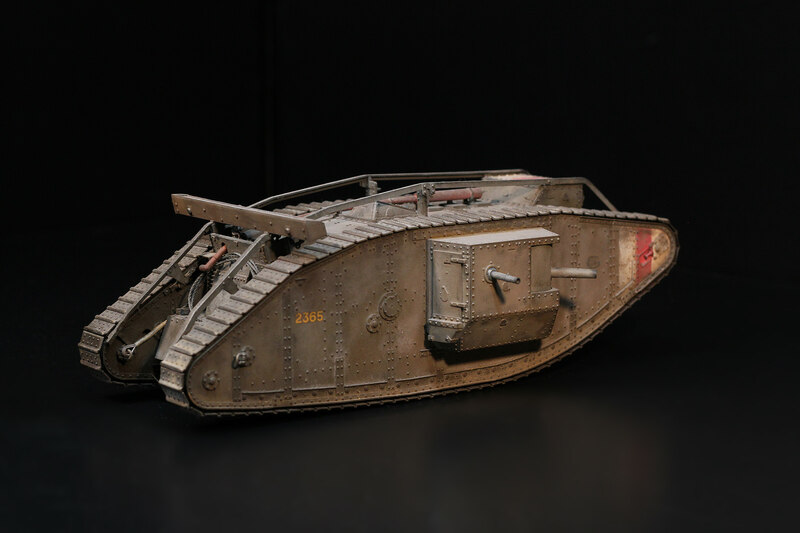 Cheers for all the info over many posts, have really just got back into model building and been out the loop way too long. No worries, just don't take anything I say as gospel. 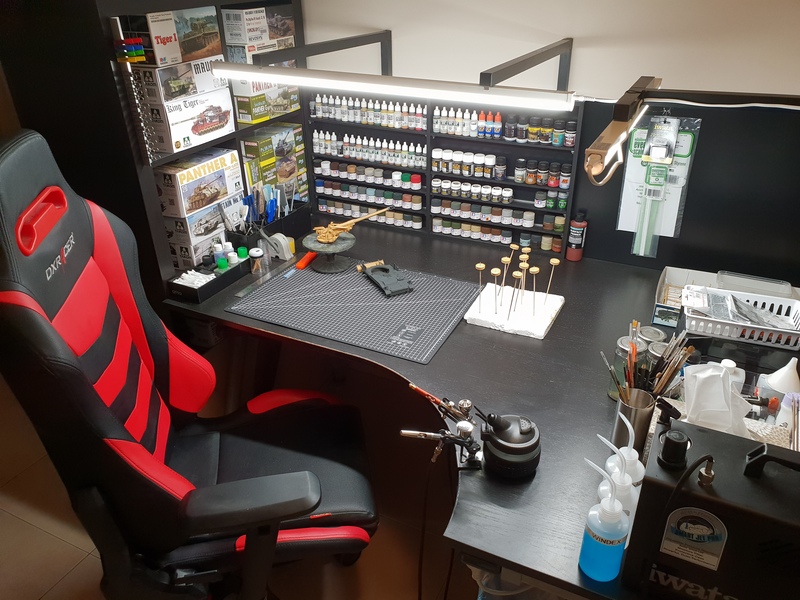 I've only been in the hobby for a couple of years now myself.